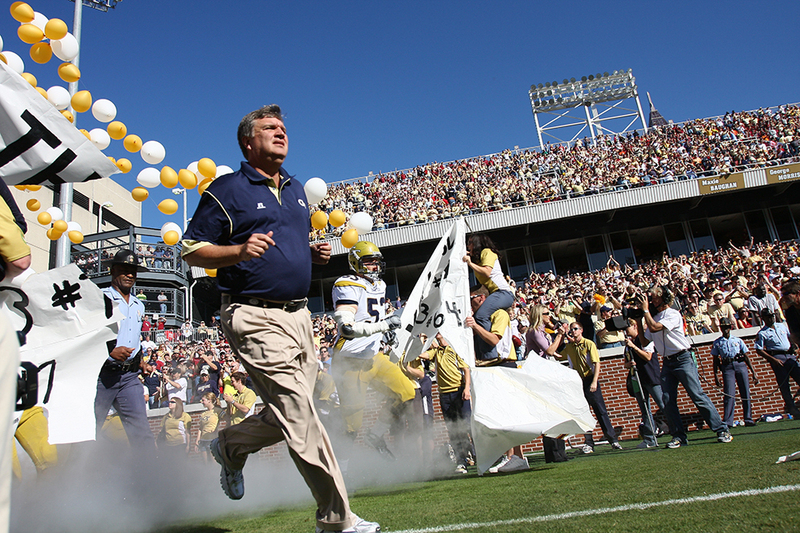 In his seventh year at Tech, Head Coach Paul Johnson’s offense has reached new heights and has surprisingly become his best and most efficient yet. When the year started, most didn’t know what to expect from Tech’s offense due to graduation of several key starters such as David Sims and Robbie Godhigh. Tech was also going to be breaking in a new starter at quarterback in redshirt sophomore Justin Thomas. Most assumed former quarterback Vad Lee’s transfer was a bad sign for Tech; but it was actually a blessing in disguise. With Thomas having the higher ceiling, it was safe to assume that he would have won the quarterback job regardless of Lee’s decision. After the departure of Lee, media members throughout the South thought Johnson was losing control of his program, and many local writers thought Lee’s transfer was negative momentum in Johnson’s tenure at Tech. Despite criticism, Johnson has been able to turn this team into his finest work yet even though the team has six new starters this season on offense. Tech has averaged a Johnson-tenure high of 37.1 points per game through eight games as well as highs in rushing yards (326.1), passing yards (155.8) and percentages in converting third (58.06) and fourth downs (77.78). The offense has become the most efficient in the country due largely to the entire team buying into the system this offseason. Besides starting a new quarterback, another big difference this year is that Johnson ditched the pistol and diamond formations the team ran last year with Lee. Countless times, Tech lined up in those formations, and it seemed like the base formation of Johnson’s spread option offense was not as polished due to having less reps during spring training and fall camp. Going into the season, Johnson made it very clear at ACC Media Day of his offensive plan was for this season. “More option, more triple option. We really got away from it a year ago. We ran very little triple option. We weren’t very good at it,” Johnson said. Johnson is proud of his young offensive line and called it the best he’s ever had and that guys are continuing to improve and blow people off the ball. The line is anchored by senior Shaquille Mason, but there are several new players on the offensive line making a major impact. After a bitter ending to the season last year, it seems that not only did Johnson enter the year rejuvenated, but also did every other offensive coach. One of the coaches who has done an outstanding job this season is A-back coach Lamar Owens. Coach Owens played under Johnson at the United States Naval Academy. “One of the biggest differences between last year’s offense and this year’s offense is definitely the turnovers. This year we average about 1 per game, and last year we averaged over 2 a game. So that extra possession is really helping us get more in a rhythm and confidence with what we’re doing,” Owens said. Owens belives credit is due to Johnson and Thomas for working well together to make sure the team has the correct play. “I think the efficiency of our offense starts with Coach Johnson calling the plays and with Justin. I think Justin is doing a tremendous job of reading the option and keeping us out of bad plays. He’s doing a really good job of leading the offense, and I believe that the rest of the guys on the offense and team believe in Justin and have his back, and that’s definitely helping us be more efficient,” Owens said. Owens has helped with the breakout years of all of the A-backs this season. Redshirt seniors Charles Perkins and Tony Zenon are having career years, and junior Broderick Snoddy looks like a completely different player this season. The development of these players along with the quarterback and offenisve line have helped Tech become the most efficient offense in the country according to some metrics. The wide receiver duo of seniors Darren Waller and DeAndre Smelter have added an unseen dimension to the offense as well, as both receivers have become even better this year. Usually Tech relies on one receiver to carry the load for the passing game, like Demaryius Thomas did in 2008 and 2009. This season, Smelter has caught 20 balls for 462 yards and five touchdowns as well as 96 rushing yards. Waller has 10 catches for 205 yards and two touchdowns. Both of them also excel at blocking for the rest of the team. Tech enters their homecoming game with another challenge ahead of them against the University of Virginia, and the offense is looking to replicate last week’s performance against Pittsburgh where they scored 56 points.